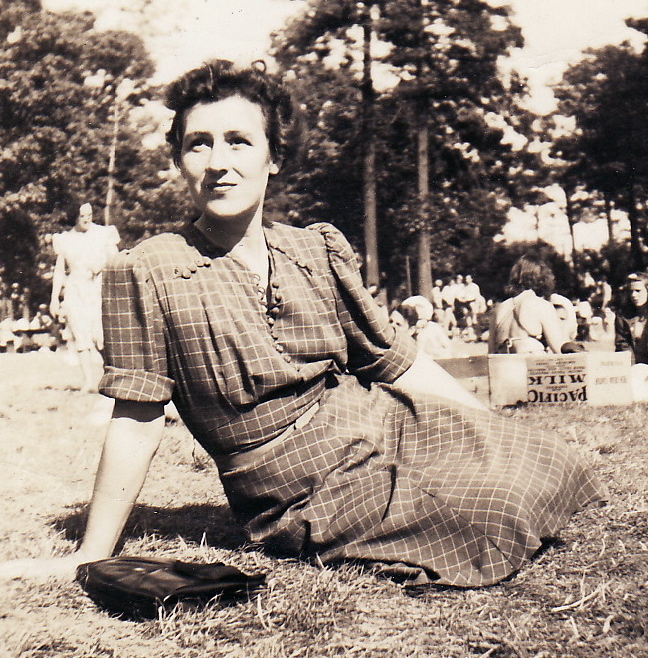 My grandmother Betsy. What drives me to know her story? I’m writing a family memoir. I didn’t plan to write one. I set out to write my own story—not for publication necessarily, but for my kids and my (unborn) grandkids. I want them to know who I am—in my words. The more I write my story, though, the more I understand how inextricable my family stories are from mine. The late poet Maxine Kumin described how, “like those old, pear-shaped Russian dolls that open at the middle to reveal another and another,” we carry our mothers forth in our bellies. I carry not only my mother, but her mother, hers, hers, hers, and hers. I carry my father, too. I carry his brother and each of their seven sisters, and their mother, my grandmother Eva, who died before I was born. This notion delights me—not only because it justifies my big belly. It delights me because it explains my incessant curiosity about my family stories. To learn the craft of writing a family memoir, I turn to other writers’ family stories. One that deeply resonates with me is Janice Kulyk Keefer’s Honey and Ashes (HarperFlamingo Canada, 1998). Keefer is a gifted storyteller who comes from a family of storytellers. In Honey and Ashes, she writes “what had only been spoken”: her mother’s, aunt’s and grandmother’s accounts of life in “the Old Place” and their struggle to make a new life in Canada. Staromischyna, the Ukrainian village her family left in 1936, is as real to Keefer as the Toronto in which she grew up, though she is 44 before she sees the Old Place with her own eyes. A world out of Grimm’s fairy tales, “as rich and strange as embroidery”—this is the world Keefer evokes in Honey and Ashes. With a poet’s ear for the rhythms of language and a novelist’s gift for narrative, Keefer makes the Old Place palpable. Every Sunday morning Melania would walk to the house of her younger, cast-off daughter and put on the church-going clothes she kept there: a severely cut black blouse and a woollen skirt, a funereal waterfall of folds. The blouse and skirt hang in the svitlytsia, safe from dust and disturbance. Except when Natalia takes it into her head that the doll she’s conjured up from a potato masher needs a dress to keep it from turning back into a lump of wood. She steals into the svitlytsia one afternoon … Spreading the huge black skirt over the floor, she finds an innermost fold from which she can cut a square large enough to wrap round the potato masher. What name does she give her doll? Something opulent like Roxolana, after the priest’s daughter captured in a Tartar raid in the early 1500s, sold from a slave market in the Crimea to the Sultan Suleiman the Magnificent? Or Yaroslavna, Solomea—names that can carry off a dress of best black wool? She’s already parading herself in the streets of Ternopil’, this doll, inquiring into shop windows with a regal stare as Natalia returns the skirt to the hook on the door, puts back the scissors, picks up every last thread that could give her away. It’s God who undoes her—her grandmother’s immense pride before God. For next Sunday at St. Nikolai, when Melania kneels before the pictures of God and his mother set on the small table before the icon screen; when she makes her deep, dramatic bow so that her forehead touches the cold clay floor, her skirts fan out and a loud whisper comes from the people massed behind her. Melania, Melania, cover yourself, everyone can see. The glare from her cotton drawers, a white square the exact length of a potato masher. To understand her family’s history within a wider cultural context, Keefer studied maps, old documents, and history books and deftly threaded her findings into the stories. Where Honey and Ashes bogs down is where Keefer cluttered the air around her stories with unnecessary facts. As storyteller, her words flow rhythmically. As analyst, her language is awkward, halting, stiff. She frequently thrusts herself into the stories in ways that interrupt and distract: I know that this happened, I’ve been told that this happened, instead of simply saying “this happened.” I suspect she does so because she is burdened by knowing she is introducing errors into her family’s history. Her book—of necessity—is a partial construction. I understand her burden—I share it—but I grew impatient with her disclaimers. I wanted the stories—and I didn’t care if they weren’t entirely true! Is what I want, then, fiction instead of memoir? I don’t think so. One of the most poignant moments in Honey and Ashes comes when Keefer travels to the Old Place in 1997 and discovers that almost nothing remains of the world her mother and grandmother described. Even the mighty river Zbruch, the blue-green Zbruch with its treacherous current, is reduced to a puddle. Keefer is shaken. If they are not, then the map to her past can’t be trusted. But no—the river’s course was altered by engineers. The river her mother remembers did exist. It still does—but it’s been forced underground. “Why do we become obsessed with where and whom we come from?” Keefer wants to know—and so do I. Like her, I am haunted by ancestral villages I have yet to see. My head is filled with rooms full of people long dead. I share her belief that family stories “travel through us and map us.” Keefer’s search for identity in her family’s past resembles my own. And though I greatly admire how she makes her family history relevant to a wide audience, I was disappointed that her personal journey never leads her “home.” Keefer ends her book as she begins it—searching, longing. Here is a dilemma faced by writers of memoir: what to put in, what to leave out. One thing I wish Keefer had left out is her angst about Ukrainian anti-Semitism. Though the chapter “Each Small Hand an Open Eye” reveals much about the author’s experience of her own ethnicity, it seems to belong to another book. No evidence exists that her family mistreated their Jewish neighbours. In fact, her evidence points to the contrary. For Keefer to interpret her family’s pre-WWII experiences through a lens of contemporary Ukrainian-Canadian culpability is to do her family—and her readers—a disservice. Still, I loved this book. Honey and Ashes is beautifully written and it does what a family memoir should do: it illuminates the universal through the personal—and it tells a good story. Memoirs are my absolute favorite type of book to read! And I’m very liberal in my definition of a memoir. It can be a sweeping saga going back generations, or a particularly interesting year in someone’s life. My bookshelves are loaded with memoirs. Over my summer vacation (mostly on the plane rides to and from Canada), I devoured two memoirs – both of which I adored! The first was “North of Normal: A Memoir of My Wilderness Childhood, My Unusual Family, and How I Survived Both” by Cea Sunrise Person, a Vancouverite. She recounts her extremely out-of-the-ordinary and poor childhood, raised by her hippy grandparents and single teenaged mother who moved from California to live in the Alberta bush in a tipi when she was just a baby. Her story is so much fun to reach, in my opinion, because she allows herself to fictionalize some of the details that she couldn’t possibly remember but that add to the richness of the storytelling. She explains her approach in her blog entry “Growing a Tree: Truth and Fiction in Memoir Writing” here: http://ceaperson.wordpress.com/2014/02/01/growing-a-tree-truth-and-fiction-in-memoir-httpceaperson-files-wordpress-com201402untitled-2-jpgw503writing I think you’d like it, Leslie. Novella’s writing is a bit less polished, but very honest and very interesting. While she had all the reasons in the world to rage against a father who deserted her as a child and continued to act like a jerk, her story all includes a lot of self-reflection about her life, her choices, and her faults. So on that note, thank you for continuing to share your stories, Leslie. I so much enjoy reading them…and am amazed by how many blog posts you’ve entered in the past couple of weeks! You have a real gift of storytelling and I’m sure your memoir must be a real hoot! And if you’re looking for a good book, check out these ones! I’d send you my copies but I bought them on Kindle to avoid lugging around books on vacation. Have you read “Urban Farm”? I will check those out, Diana, thank you. I haven’t read Urban Farm – I’ll look for that, too. All original content is copyright Leslie Prpich 2014-2019. All rights reserved.